They are so called because of mixed Indian/Spanish ancestry and their primary economic activity. They live at the seashore in small towns or compounds. 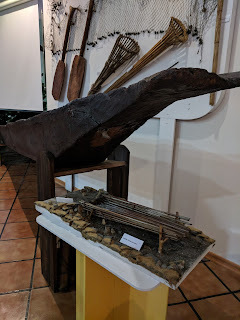 Fishing in canoes and bongos*, using cast nets, trammel nets and other devices, is done at night or at dawn, as a group, and they return at noon. They tend to be organized in cooperatives and are abandoning traditional techniques and boats. 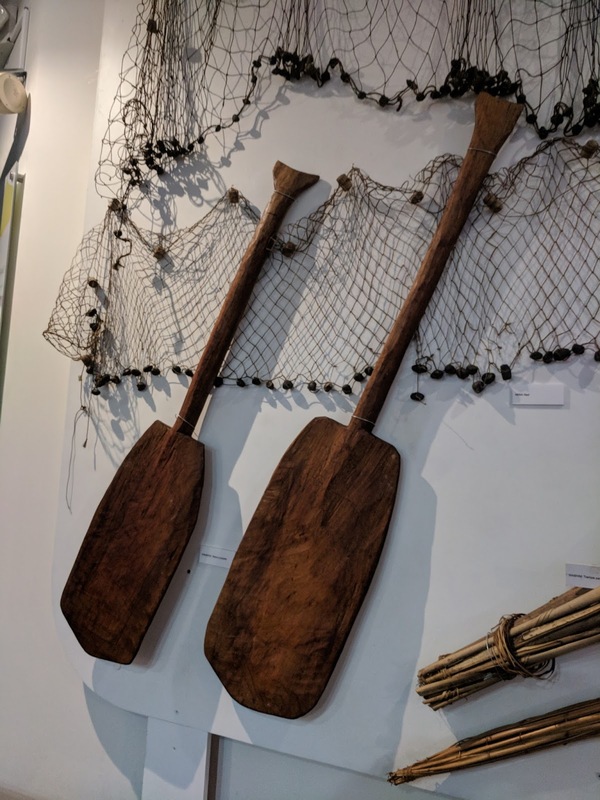 The mangrove is an important part of the coastal ecosystem; However, in the places where the fisherman lived traditionally, shrimp farms and logging are now causing major alterations in the life of the inhabitants and in the natural balance. The cholo pescador's language is Spanish, with unique modalities and tones. It has a rich poetic and narrative oral tradition. (The culture's) main festivals are those of the Virgin of Monserrate, María Auxiliadora, San Jacinto and St. Peter the Fisherman. *The meaning of "bongo" as a type of watercraft is unknown. Reader input is requested. There are no frames or floor timbers. A single sitting thwart (beneath the religious statue) is the only interior structure. A ringbolt (not visible here, but shown below) near the end at the left of the photo presumably designates the bow. 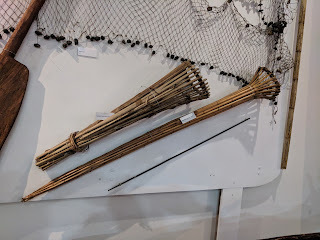 The associated fishing net seems to have a drawstring at the bottom. We believe this is a cast net with a purse-type closure. Both ends have small, shaped transoms well above the waterline at the ends of the upward-rising flat bottom. 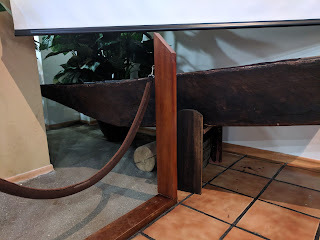 The garboard plank is rabbeted into the sides of the transom. There appear to be at least four strakes of varying height per side. 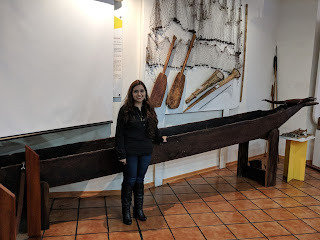 The planks are quite thick and the boat is probably too heavy to be carried by one man. We could not make out the method of fastening, but suspect the planks are edge-nailed to one another. Several sheet metal patches have been fastened with nails on the exterior to repair damage, and painted over. 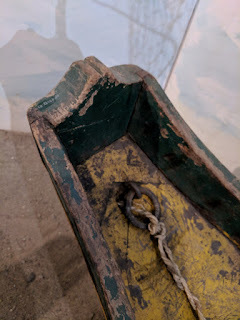 Ring bolt fastened through the bottom at the presumed bow to secure the painter. Plan view of the stern shows that the bottom is made of three strakes, the center one being the widest. The rising ends of the bottom are separate pieces from the central bottom plank, and they are hollowed, dugout-style. This is an interesting, rarely-seen stage of boat development, representing a small step between the extended dugout and the purely plank-built craft. Also apparent is the substantial shaping of the side planks. (The bow is similar.) Given their thickness, we presume the planks are hewn to the desired curves near the ends rather than bent to shape. The builders may find it easier to build the canoe with a transom than with stemposts and sharp ends, but the substantial hollow of the planking curve just inboard of the transom appears to have no functional explanation, and is probably aesthetic, or perhaps a design holdover from earlier dugout construction. It is somewhat reminiscent of the extended platforms at the ends of many dugout canoes from Ecuador and elsewhere. 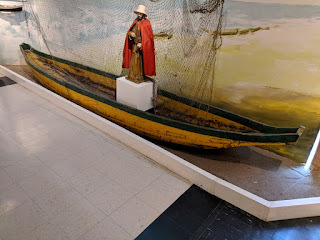 This model is also part of the cholo pescador section of the same exhibit. 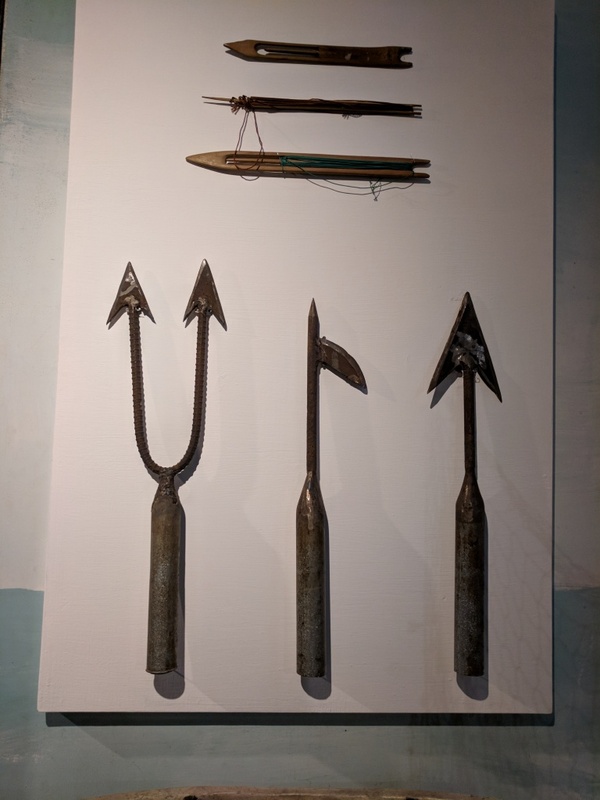 It depicts a larger, more seaworthy, double-ended type with sharp ends, probably used by the same people in more open waters along the coast. 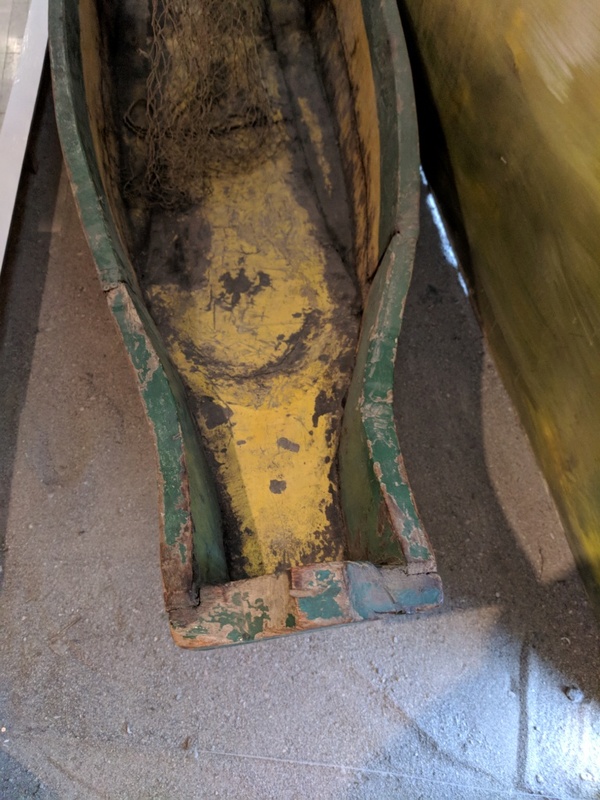 It shows two sets of internal, sawn frames, two heavy thwarts, and seats at both ends. It is unclear whether it represents a large extended dugout or a boat that is entirely plank-built. 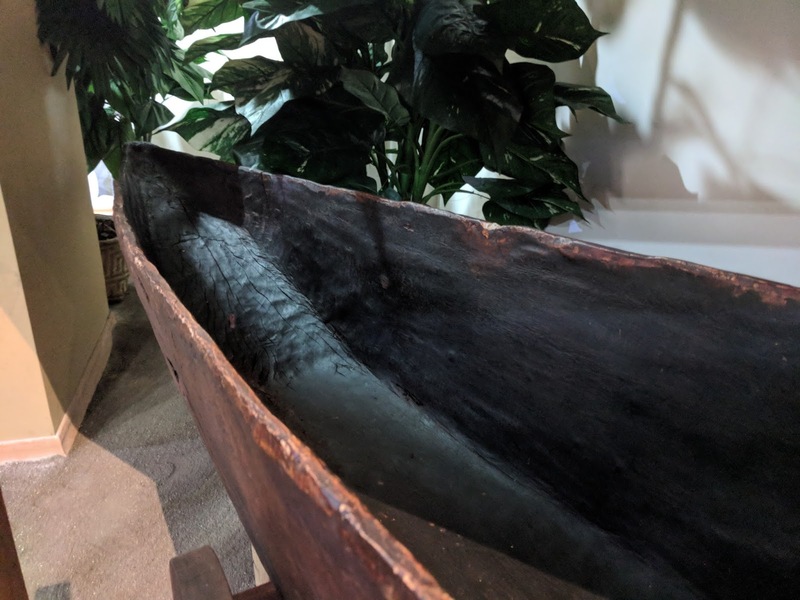 The boat would accommodate a larger crew than the small canoe shown above and be capable of taking significantly larger catches. On a recent visit to Ecuador, we did not have an opportunity to observe any boats in the field, but we did manage to visit museums in Quito, Cuenca, and Guayaquil that had items of interest on exhibit. 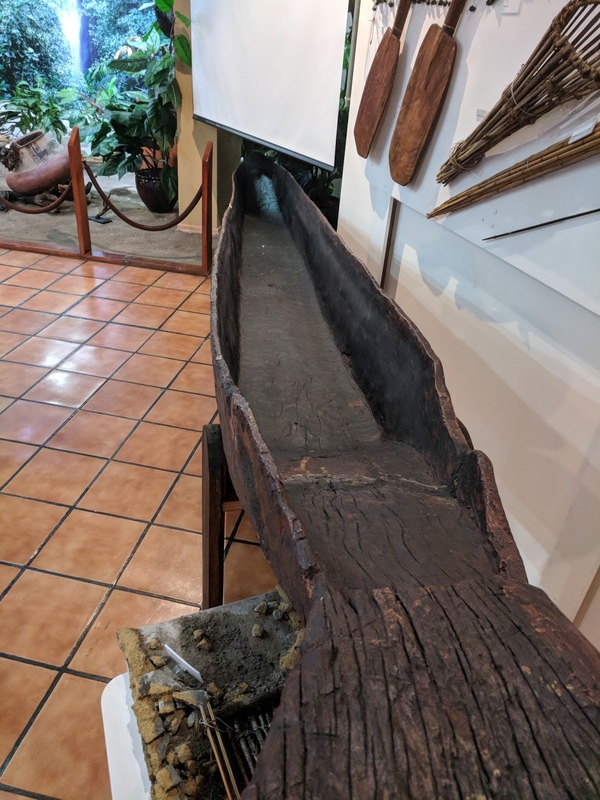 These included miniatures of dugout canoes and canoeists, and boat-related artifacts, from a number of precolumbian societies, as well as a couple of contemporary canoes, related implements, and models. We'll organize them in more than one blog post according the museums in which they appear. 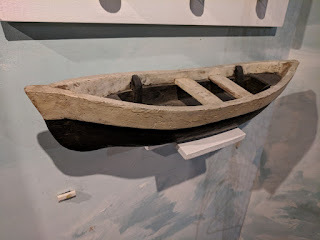 A view of the stern shows: rather straight sides and a flat bottom meeting at a hard chine; a sharp, angular transition where the bottom begins to rise toward the end; and a large overhanging stern platform where the paddler might sit. Top view from the stern. From bottom of image: the stern platform; the flat, angular transition between the platform and the interior bottom, which is flat; nicely thinned sides, somewhat bulged outward amidships. The bow is pointed in plan view, rounded in section view and curving smoothly into the flat bottom. The interior appears to have been treated against rot and insect infestation by charring. Adze marks are visible. 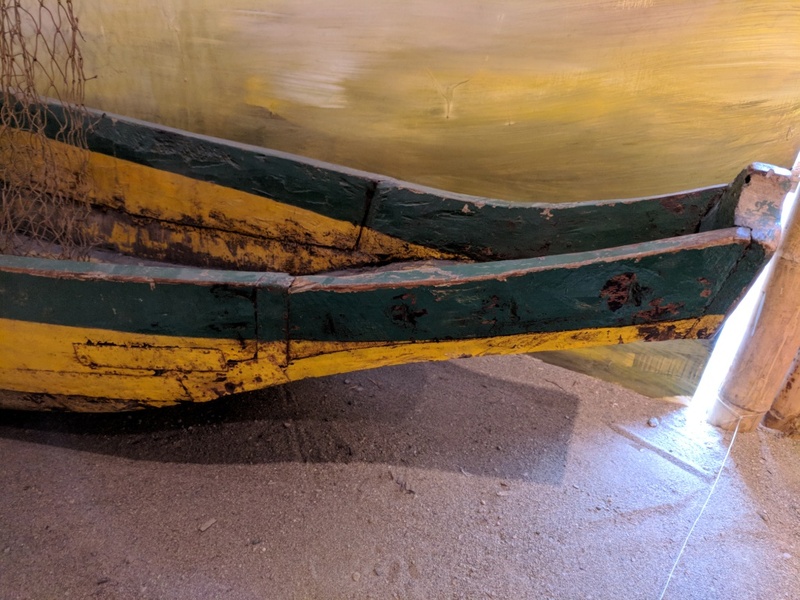 Exterior side view of the bow shows a somewhat sharp, angular transition between the bottom and cutwater -- a surprising element, given the bow's appearance when viewed from above. Tool marks are visible on the exterior surface, showing capable adze or ax work but no attempt at smoothing through abrasive methods. The accompanying paddles are carved entire. They feature extremely large, heavy blades, short shafts, and triangular grips. The triangle of the grip of the paddle on the left departs from the shaft more abruptly than the one on the right and has a more distinct concave curve on its top edge. On both, the shaft extends somewhat into the blade and tapers gradually to the flat surface. a. 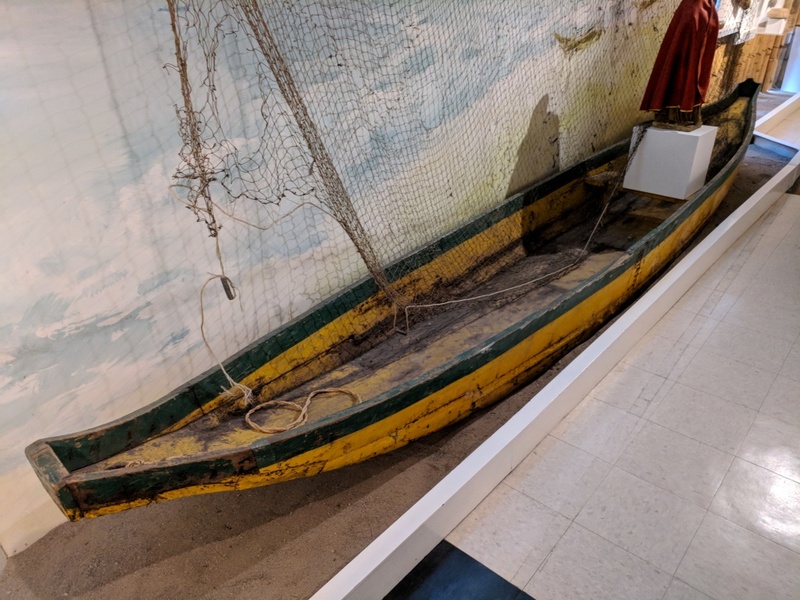 The weighted net is little more than a foot in height; it is presumably stretched across a shallow, narrow stream or a constrained section of a wider one; an alternate explanation is that it might be stretched between two canoes and trawled. b. Two fish traps: the lower one is roughly 3 feet long. With their very small openings, it's unclear how they work. (Perhaps bait is placed in the narrow end and a fish, after entering the trap to obtain the bait, is unable to back out?) Reader input is solicited. c. The metal shaft might be part of a lance or harpoon. No explanatory material appeared.